Newport Beach, Calif. — As an estate fiduciary or trustee, determining an accurate or reasonable value for inherited or estate jewelry items can be challenging and even bewildering for many. In order to have an equitable division of wealth in an inheritance situation, setting a standard for valuation that all parties can understand is very important to a smooth distribution. A clear understanding of valuation standards can help to remove doubt about whether an item should be considered a $10,000 jewelry item or a $500 item. The standard of value establishes the dollar value of a jewelry item based on a set guideline. The same item of jewelry can have at least four different dollar values and each value can be both true and valid. There are four main jewelry appraisal standards. Each standard prescribes a set of guidelines for determining jewelry values. The four standards are: replacement price value, estate value retail, estate value wholesale, and intrinsic value. Choosing the correct value standard for the inherited jewelry is critical to an equitable division among all parties . The most common jewelry appraisal is an insurance appraisal for replacement purposes. Most anyone with insurance coverage understands this one type of appraisal. The purpose is to provide an estimate for replacement of an item in the case of theft or destruction. This valuation standard produces the highest price for jewelry value. However, it is a theoretical value based on how much it would cost to replace the jewelry item with a new one. It is not the value of the jewelry itself, but what a new jewelry item like the piece would cost. As a classic example, under a replacement value standard, the value of a used or pre-owned item would be valued at the current price of a brand new item. Of course, used or pre-owned items are seldom worth as much when trying to resell them, but that is its replacement price, and that is the value that an insurance company expects to see in a claim. The replacement value insurance appraisal has the least correlation to the actual market value of the jewelry item. So, even though insurance appraisals are commonly available, this would be the least accurate standard of value to use when dividing inherited or estate jewelry. The next standard of value has a direct correlation to the value of a jewelry item. The estate jewelry at retail value estimates the price an item would sell to a used jewelry customer. The word estate in this context simply means used or pre-owned. When someone chooses to buy a piece of used jewelry, excluding cases of rare or highly sought after pieces, one of the main motivations is to save money. A used piece of jewelry will be worth less to buyers than an identical brand new item. Used jewelry buyers generally shop on online auction and sale websites such as eBay or Craigslist to save money. To accurately arrive at the estate jewelry at retail value you must try to ascertain how much consumers have historically paid for like items of used jewelry. With both eBay and Craigslist it is not easy to figure out this value since most of the time you only have an asking price and not the final negotiated price. A more accurate way to determine estate jewelry at retail value is to research auction records. Most auction houses have access to historical records for past auction results. This information is the best source for determining final negotiated price. All auction houses should have past auction records for their own sales but many also have access to other auction houses sales. Most auction houses also use a gemologist to establish gem quality. This is because auction house reputation depends upon accurate descriptions and price estimates. An auction house with historical records and certifications from gemologists can give a very accurate estate jewelry at retail value for your items and are the most qualified to get the best market price at sale. The estate jewelry at wholesale value is the price a business who sells used jewelry is willing to pay. This price will be lower than the estate retail value because of buyer needs to add all the cost of business to sell an item plus some profit. The jewelry needs to be in good condition without need for repair and should be of a style that will sell relatively quickly. Condition of estate jewelry items have a very significant impact on whether an item is saleable. Missing stones, non-working Piaget or Rolex watches and bad repairs including obvious ring resizing all affect the wholesale value of an item. Some wear may be expected, especially for antique items. However repairs have a cost and you should expect to pay for this cost in the final negotiated price. Style is the second most important consideration in wholesale valuations. Clustered stone cocktail rings are an example of jewelry items that are no longer in vogue. While the number of diamonds may be dazzling, the sad truth is few buyers will want to wear such an item. Most wholesalers will be reluctant to buy out of style jewelry. Compared to the estate value at retail, estate jewelry at wholesale value is generally the most easily converted into cash. It may therefore be the best value for jewelry items when a fast division of assets is desired over the highest valuation. Intrinsic value looks at jewelry as the raw materials of the item if it were scrapped. This last standard for value of jewelry is the easiest to understand and yields the lowest price. The buyers for such jewelry often don’t care about condition but rather how much the raw materials that make up the jewelry are worth. For almost all fine jewelry, the intrinsic value is a combination of the current metal value and the value of any gems or semi-precious stones. No value is added for style, condition, brand, market demand, or other factors. The intrinsic value is the lowest expected value but may be the quickest way to convert jewelry into a cash asset for fair division. Unfortunately, an entire industry has grown during the recession that has learned how to maximize their profits at the expense of customer returns. Known as cash for gold businesses they advertise heavily that they buy gold and diamonds and pay quick cash payouts. Most of these businesses do not pay for the gems and some do not pay even for diamonds. Their offers can be significantly lower than even the intrinsic value of a piece. The intrinsic values for the diamonds and other gems should be based on the cash wholesale price of the gem minus any cost for re-cutting or re-polishing the gem if it is worn or cut in an obsolete style. Intrinsic diamond and gem prices are not readily available like precious metal prices are to the general public. Gold, platinum, and silver prices are well publicized. The diamond and gem wholesale trade keeps their prices confidential, so there can be a large difference in these prices depending on the dealer. Using this standard can lead to a value that is significantly lower than what a piece is worth for resale (even quick sale). So, like the replacement value standard, even though it’s easy to understand and somewhat easy to estimate, the intrinsic value standard may not be the best choice for inherited jewelry items. How the jewelry value is determined is crucial to the people receiving a distribution from the inheritance. Generally, one or a few people are responsible with the disposition of an estate. When all parties are in agreement to the value standards that are to be used for the jewelry aspect of the estate will result in less concern about inequity. Communication of which standards should be used and how the items will be liquidated will lead to a fair and smooth disbursement of the estate. 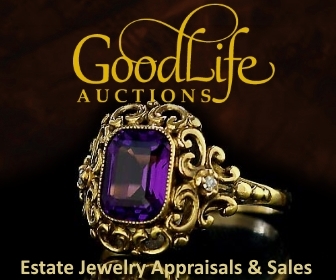 If you are an estate trustee or fiduciary and need to discuss estate jewelry values or liquidate fine jewelry or watches, please give GoodLife Auctions a call at +1 866 294 0150 and ask to speak to a jewelry appraisal specialist.